A family taps VIF Studio to rebuild a dilapidated coastal cottage on Longfellow’s historic summer property. This small cottage is part of a larger estate on Boston’s North Shore; it also includes the remains of Longfellow’s summer cabin. The community maintains strict height and historical restrictions, so VIF Studio leveraged the hillside location and built a two-story, 2bed/2bath structure featuring a stone tower. Evocative of several World War II-era submarine towers that dot the island, the tower offers expansive 180-degree views of the Boston harbor and skyline, and lends the formal language of a lighthouse. The Lighthouse negotiates between two conditions that require it to provide grandeur, yet still feel intimate. On the one side, it must pay deference to the Manor Home farther up the hill, as well as compliment the other summer cottage just a few feet away. To achieve this, the two cottages share an intimate garden tucked behind a retaining wall, and the roof of the Lighthouse angles downward to portray a more domestic articulation. 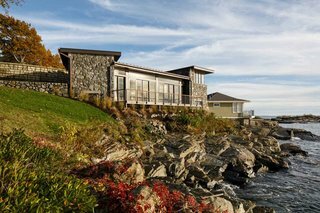 On the other side of the Lighthouse, the sweeping water views informed a design emphasizing openness and prominence towards the cove. The ceiling height extends to over 10’ high, and a large window wall blurs the boundary between inside and outside. To further erase this line, exterior field stone wraps into the great room, and the window wall is detailed to minimize transitions out to the deck beyond. Moves like this are also found in a powder room with a private outdoor shower lined in the same stone used for the facade. Through a continuity of natural materials, minimal detailing and an open — even porous — layout, the Lighthouse achieves a visceral connection with its breathtaking surroundings. To complement this cohesiveness, VIF Studio uses a soft color palette for the interior design, mixing Shaker simplicity with modern details. The resulting home is one that conveys a strong sense of place to it’s inhabitants, be they guests for a night or a season. uploaded The Lighthouse through Add A Home. The Lighthouse, ocean side, with the adjacent cottage in the background. Airy one room living/dining, with multiple sliding doors opening to a deck. The exterior field stone wraps into the interior here, further blurring the line between indoors and out. Custom shaker cabinets are painted a shade of blue to compliment the ocean view. The view from the tower bedroom, Boston in the distance. A stone wrapped outdoor shower in the second bath. Natural textures and materials used throughout in a neutral palette. The approach from the main house. The view from the living/dining room.